What is a punch list? A punch list (also called a snag list, deficiency list, or punch out list), according to the online Business Dictionary, is “a document listing work that does not conform to contract specifications, usually attached to a certificate of substantial completion.” Put simply, it is a list of to-do’s that need to be completed before a project can be considered finished. Now that we’ve covered the punch list definition, it’s perhaps more important to understand how they’re used. Punch lists are commonly tackled towards the end of a project when deadlines and tight and workers are exhausted. Which, in turn, increases error and prolongs project turnover. Answering the question, “what is a punch list?” isn’t quite so simple, as there are multiple types of punch lists, and debate over which is the most effective. One punch list best practice is the ‘rolling punch list;’ a real-time log of punch list items that develops as deficiencies arise. According to Michael Clippinger, the National Director of Quality at JE Dunn, an ENR Contractor of the Year, “a rolling punch list is the most common approach toward achieving the ultimate zero-punch list goal.” A zero punch list indicates that there is no outstanding punch list work at the time of project completion. For this to occur, effective planning, project management, and transparent communication is required. No matter whether you’re working from a rolling punch list or working towards a zero punch list goal, everyone — from the project owner to the various subcontractors — must understand their role and responsibilities in the punch list process. There are some typical punch list items, but there is no ‘general punch list best practice playbook’ for everyone to follow, but rather a set of punch list best practices for each unique team, that are briefly outlined below. When the general contractor starts a project, they should also start a punch list. It can become like a punch list checklist. Anytime they walk through a site and notice a defect, it should be documented immediately for future discussion with the owner and/or specialty contractors. Instead of waiting until the end of a project to communicate punch list items, the general contractor should produce punch list reports that are automatically sent to each specialty contractor on a given day, week, or month. Construction punch list software like Fieldwire makes the construction punch list process easy. From any device in the field, a general contractor can annotate site issues on the fly to create a project punch list and tag specific trades. They can generate a trade-specific punch list report or construction daily report in seconds and send it to each specialty contractor in just a few clicks. Repeating this process regularly will help general contractors reach project close out faster because the more punchlist items they tackle now, the less there is to do later. For the punch list process to be effective, there must be clear and consistent communication between the general contractor, specialty contractors, and owner. It is the general contractor’s duty to communicate punch list progress to the owner and communicate punch list items with specialty contractors. General contractors should implement construction punch list software that allows them to generate punch lists on the fly for specialty contractors to see in real-time. This process is far more efficient than having to manually take notes during site walkthroughs, type them up, and attach them to an email for subcontractors back in the office. Additionally, a study by the Navigant Construction Forum states “average rework on projects can cost between 7.3% and 10.9% of total construction cost (when both direct and indirect costs are included) and can cause an increase in the schedule (project delay) of approximately 9.8% of the planned project time.” One of the major causes of rework in construction, according to Jim Rogers, is workers in the field not having the information they need to resolve a contractor punch list correctly the first time. He said: “Plan changes, updates, clarifications, and submittals that occur throughout the building phase of a project create a constant challenge in terms of ensuring that the latest information gets in the hands of the people that need it in a timely manner.” For subcontractors to have access to the information they need at all times, construction punch list software like Fieldwire should be used to bring jobsite data and teams together in one place. A punch list for construction projects doesn’t have to be a hassle. For example, when a punch list item is assigned to a specialty contractor in the field, he or she will be notified in real-time. From a smartphone or tablet, they can open the punch list item on the Fieldwire app, see the exact location of it on a plan, the man-hours required, and a due date. As they work to resolve the punch list item, the subcontractor can send messages, photos, and videos to the general contractor using the Fieldwire app to communicate progress. This way, punch list items are resolved efficiently, everyone remains on the same page, and there is no need for back-and-forth emails between the various parties to communicate change. The construction project owner should be present for site walkthroughs at various stages of a project — not just at the end — so they’re aware of construction pace and progress. However, a best practice for punch is to use punch list software that fosters transparent communication should make owners feel like they know site conditions before even entering it. It is an owner-specific best practice to ask the general contractor a list of questions — such as this example punch list from Succeed with Contractors — during site walkthroughs that may spark additional punch list items. A few example punch list questions from the owner include: ‘Does every outlet work properly?’ or ‘Is there adequate paint coverage?’ If the answer is no, the general contractor will need to create a new punch list item(s) for trade contractors to address. At the completion of a project, it is the owner who will sign off on a construction punch list and ensure all punch list items are resolved. Setting up permission levels in construction punch list software that gives the owner (and only the owner) the right to verify punch list items will help the project progress in a way that meets their demands, contract specifications, and original plans. From project start to project finish, it is the architects, designers, and engineers duty to ensure all construction meets the approved, specified drawings and everything will work as intended. They must be included in final site walkthroughs to sign-off on punchlist items and confirm that the final product matches the original drawings. If the architect/designer/engineer notices something that’s ‘not to spec’ and not listed as a punch list item, he or she needs to consult with the owner to see if they had requested a change that had not been documented. Creating and following a set of punch list best practices is critical for attaining zero punch-list status and finishing construction projects on-time. 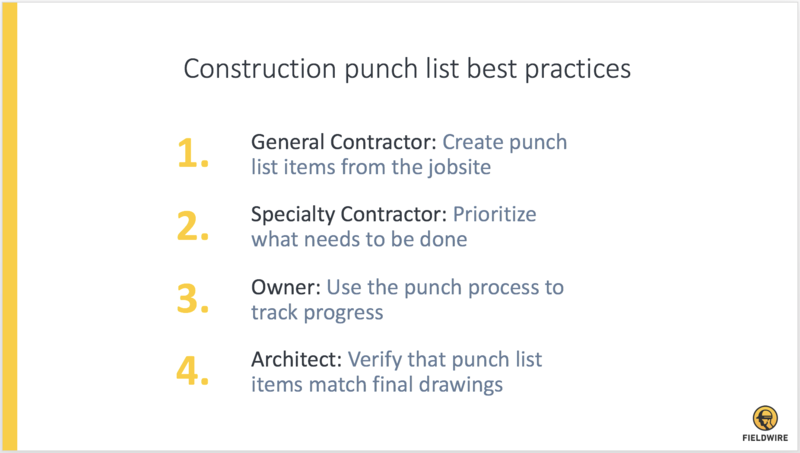 Punch list best practices — be it those outlined above or something you created on your own — also help with accurate walkthroughs, effortless reporting, and faster close out. Besides the role each group we covered plays in closing out a project, there are several other major use cases of punch lists on a jobsite. They include daily box meetings where the entire project team reviews what work they need to do that day, and universal quality control to maintain a common standard across the entire project. No one should be asking “what is a punch list?” Instead, the entire team should be on the same page, and clear as to their responsibilities and expectations. Now that we know exactly what a punch list is, we can understand its importance and how it can become overwhelming on a big project. Luckily, Fieldwire’s punch list app adds both speed and structure to your closeout process as part of our field management platform.